Oh’s slightly dowdy, slightly shaken demeanor is an acting tour de force. But it’s Comer's performance that really makes the show stand out. Last year’s massive BBC America hit “Killing Eve” is back with a new season this weekend. 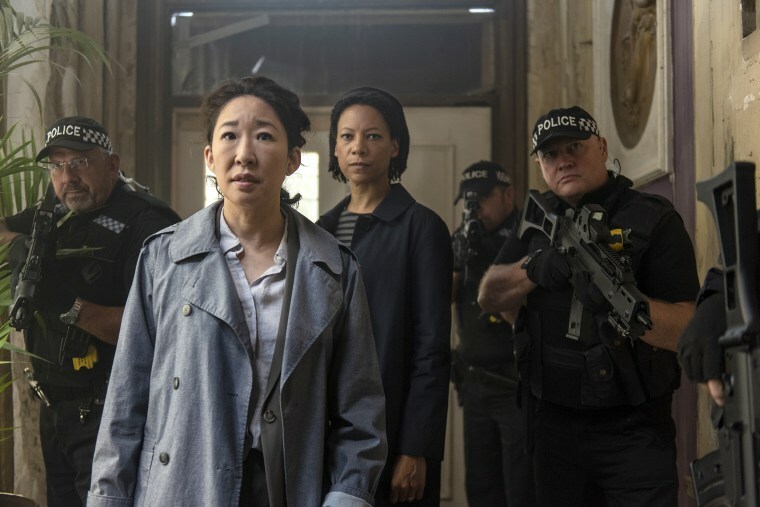 The series, created by Phoebe Waller-Bridge and starring Sandra Oh and Jodie Comer, was hailed last spring as a break-out concept, taking familiar British spy vs. spy and serial killer tropes and giving them a fresh and female-centered new spin. With season two, changes have occurred behind the scenes, but the good news is Eve (Oh) and Villanelle (Comer) are still the same madcap pair fans fell in love with. Like most new cable-bound series, BBC America had to act boldly to get the attention of viewers, pulling the “renewal before premiere” trick in hopes of assuring potential viewers that the show wasn’t going to be immediately cancelled out from under them. This doesn’t always work. (Lifetime’s failed experiment with “You” comes to mind.) “Killing Eve,” however, has been a critical hit, as its Emmy nominations can attest. With season two, changes have occurred behind the scenes, but the good news is Eve (Oh) and Villanelle (Comer) are still the same madcap pair fans fell in love with. Unfortunately, Waller-Bridge found herself having to choose between her original hit series “Fleabag” and “Killing Eve;” she ended up passing the “Eve” torch to writer Emerald Fennell, and directors Lisa Bruhlmann and Francesca Gregorini. Luckily, the loss of Waller-Bridge doesn’t seem to have dulled the show’s knife-edge at all. In the first season, bored ex-pat Eve Polastri (Oh) deduces that a string of high-ranking deaths are actually the work of one woman, Villanelle (Comer.) Given the job of solving the murders as part of a secret MI-6 assignment, her obsession with Villanelle nearly destroys her perfectly nice marriage to Niko (Owen McDonnell). In the finale, Eve finally tracks Villanelle down to her Paris flat and stabs her. The new season begins all of 30 seconds later, with Eve desperately attempting to escape what she believes is now the scene of a murder. Naturally, Villanelle is bloody but not at all dead. As Villanelle lies, cheats, and murders her way through Paris in search of medical aid, Eve returns home and tries to act like nothing happened. Fennell nails the wacky, off-kilter drive of Eve, who now finds herself driven back into housewife-in-denial mode — with much higher stakes. (Niko, newly aware of his wife’s new and interesting life, patiently waits for Eve to come to her sense.) The spell is broken with the return of Eve’s manipulative MI-6 boss Carolyn (Fiona Shaw), who circles back around to inform Eve she’s not really fired, at least not yet. More victims of Villanelle have shown up, and the game is once more afoot. Besides, while Eve might not admit what happened in Paris, Villanelle isn’t about to take a stabbing lying down. Eve needs to stay on the case because it’s the only way to stay safe. Like last season, Oh’s slightly dowdy, slightly shaken demeanor — even as she brazenly hunts down a brutal killer — is an acting tour de force. But once again, it’s Comer's performance that really makes the show stand out. Every straight woman needs an insane foil, and Comer is there every step of the way, playing a character who is always several degrees removed from normal. When Eve tells her husband watch out for anything out of the ordinary, she’s not kidding; one never knows which direction this assassin will head next. Few characters on TV right now are as casually manipulative — or lethal — as a woman who cares less about being injured than about securing a kiddie sticker and a lollipop for being stabbed in the first place. The rest of the cast is just as superb as well, with new faces — including Edward Bluemel and Nina Sosanya as additional members of Eve’s team in London — instantly falling into the show's ridiculous rhythms. The feminine sensibilities of all the jokes — whether referencing simple skirt static cling realness or Shaw’s deadpan explanation of her beauty routine — remain a production highlight. But of course, the real thrill is knowing that Eve and Villanelle are once again on a crash course. Who will survive the next round? When asked if she might come back season three, Waller-Bridge, who continues to act as executive producer to the series, demurred. Speaking at the Television Critics Association earlier this year, she said, “No, hopefully we’re going to continue this tradition of handing it on to a different woman every single time. Because that would be a really cool thing to do, to give other voices in the same story a go.” So far, the idea is working. It seems like as long as the show continues to mine comic material from the feminine side of the spy world, “Killing Eve” will succeed no matter which woman is behind the wheel.